If You Cant Design a Graphic To Save Your Life, and Your Sales Pages and Minisites Look Like a 5 Year Old Designed It, Youre In Luck! Pulling your hair out cause you cant find decent sales page templates and graphics for your projects and you cant afford those high graphic designer fees? Banging your head against the wall because your graphic designing looks like you have 5 thumbs on each hand? Look, you have enough to do and enough hats to wear as an Internet Marketer, without having to be a web designer and graphic designer too. You dont have to worry about any of that. Not anymore. Create Your Own Great Looking Minisites and Sales Pages, Quickly and Easily - Right Now! Thats where my brand new minisites templates package comes in. These minisite templates are designed to be easy to edit, great looking and help you get a professional looking page up and running in no time. Easy to use, quick to set up, with minimal (but really easy) graphic editing, or no graphic editing at all. These templates are pre-formatted for easy editing. Just replace the existing text with your own content , and link up the payment button to your payment processor. Next, you can edit the .psd header and footer files included using Photoshop or some other editor to put your own text there, and youre ready to go! Cant edit .psd files? Not to worry, Ive included blank .png header and footer files for you so you can use your favorite graphic editing program to customize those files with your own text. Easy as pie! As The Man Says...Hold on! Thats Not All! These templates also comes with a blank .png file for the headers and footers, so you can open it in your favorite graphics editor and fully customize the text on the graphics! Ive also provided .psd files for Photoshop users. 5 Animated .GIF Order Buttons! You get 5 animated .gif buy buttons, which you can use on your sales pages. You get 3 Click Here To Order and 2 BUY IT NOW! animated order buttons you can use to draw extra attention and get your customers to order NOW. Pre-formatted for easy editing. Includes testimonial box and Buy Button. Ive also included .psd and blank .png header and footer files, so you can easily edit the headers and footers with your own text! These animated .gif buttons will help to motivate your buyers to BUY NOW!. Whew! Thats a load of goodies! 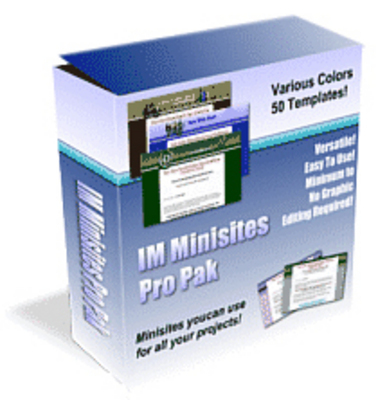 50 professionally designed minisites, complete with pre-formatted sample content (just replace with your real text), testimonial box and order button. Then you get 2 bonuses...5 more minisite templates and 5 animated .gif order buttons! Wow! I think I overdid it this time, but thats okay, because YOU get the benefit! Oh, and dont forget, you can edit the text graphics for the niche templates by using the blank .png and .psd files that Ive also included!